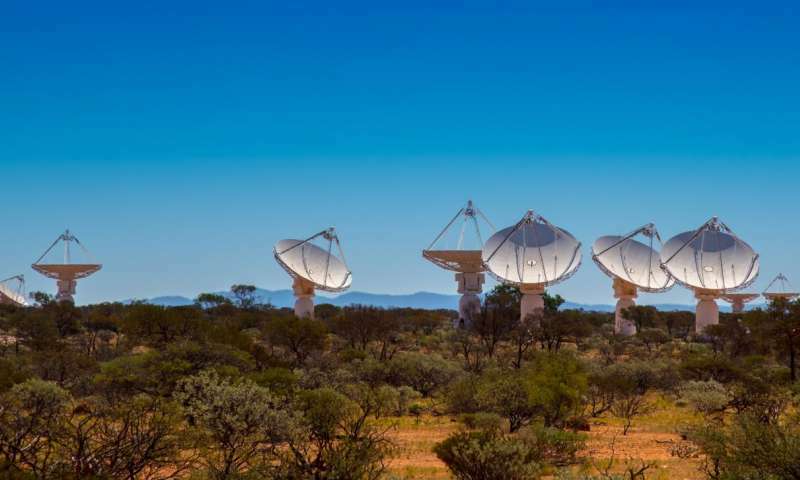 The discovery came so quickly that the telescope, the Australian Square Kilometre Array Pathfinder (ASKAP) near Geraldton in Western Australia, looks set to become a world champion in this fiercely competitive area of astronomy. 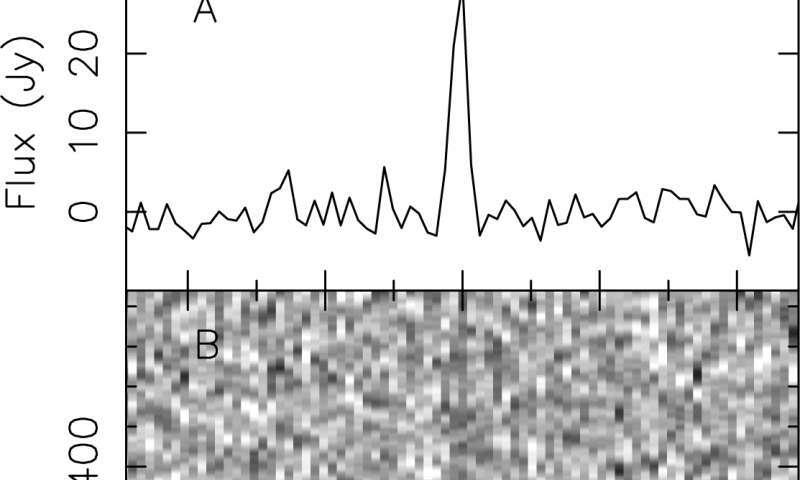 The new fast radio burst finding was published today in the Astrophysical Journal Letters. 'Fast radio bursts' or FRBs are short, sharp spikes of radio waves lasting a few milliseconds. They appear to come from powerful events billions of light-years away but their cause is still a mystery. The first was discovered in 2007 and only two dozen have been found since. The discovery of the new burst, FRB170107, was made by CSIRO's Dr Keith Bannister and his colleagues from CSIRO, Curtin University and the International Centre for Radio Astronomy Research (ICRAR) while using just eight of the telescope's 36 dishes. The discovery is the culmination of a decade of science and engineering development by CSIRO and Curtin University. "We can expect to find one every two days when we use 12 dishes, our standard number at present," Dr Bannister said. To make the most recent detection, the researchers used an unusual strategy. "We turned the telescope into the Sauron of space - the all-seeing eye," Dr Bannister said, referring to the dark overlord in Tolkien's "Lord of the Rings". Usually ASKAP's dishes all point at the one part of sky. But they can be made to point in slightly different directions, like the segments of a fly's eye. This multiplies the amount of sky the telescope can see. Eight ASKAP dishes can see 240 square degrees at once - about a thousand times the area of the full Moon. The new burst was found as part of a research project called CRAFT (Commensal Real-time ASKAP Fast Transients survey), which is led jointly by Dr Bannister and Dr Jean-Pierre Macquart from the Curtin University node of ICRAR. Dr Macquart said the new burst was extremely bright and that finding it was "as easy as shooting fish in a barrel". FRB170107 came from the edge of the constellation Leo. It appears to have travelled through space for six billion years before slamming into the WA telescope at the speed of light. The burst's brightness and its apparent distance mean that the energy involved is enormous, making it extremely challenging to explain. "We've made a hard problem even harder," said Dr Ryan Shannon (CSIRO, Curtin University and ICRAR), who analysed the burst's strength and position. CSIRO Chief Executive Dr Larry Marshall said the FRB detection was a sign of the full potential of ASKAP. "Radio astronomy has a long history of innovation in high-speed communications, and this unique capability is embedded into ASKAP - from the receiver to the signal processing - making it a uniquely powerful instrument for astronomy," Dr Marshall said. In addition to the discovery of the new burst, Dr Bannister has a big reward - a happy family. He'd been telling his three kids for months about his plans. "Every day as I left for work they'd ask, 'Are you going to find a radio burst today, Daddy?'" he said. And when it finally happened, "they were too excited for words". "They just looked at me, smiled, and gave me a great big hug!"